E-Link owns more than 15 variable styles and sizes of the plastic cress stitches for your selection. Available sizes: dia.2-1/2", 5" x 7", 2-1/2" x 3-1/2", 7", 3", 8", 4", 8" x 10', 5", 10', 4" x 5-1/2", 4" x 4", 6", 6" x 6"
Each hoop is with one brass hanger. 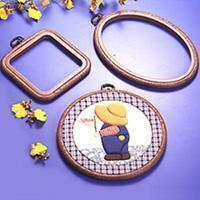 When the embroider pictures is finished, the hoop becomes a beautiful wall plaque. Different surfaces of the hoop -- smooth, square, wood-grain, rope type, with gold dots.